We have been cleaning up some store issues at Amazon, B&N, Kobo and iBooks. 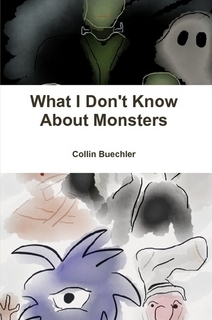 These include things like unifying the author name to Collin Buechler or Collin W. Buechler so we are easier to find on the stores. Also making certain that covers are all correct and that there are no gaps in availability at each bookstore. We have also been working to make pricing uniform across all platforms. With the exception of Skulls for $1.99 on NOOK we are uniform on the pricing of all eBooks. Speaking of eBooks, you will notice that there are two new eBooks available from the site. These are Harbinger (long held captive by Publish America, finally back under our control), and What I Don’t Know About Monsters. Harbinger is a tale of horror and mystery with a demonic spin. It has elicited the following comments “too scary to finish reading,” and “Where did I go wrong in raising you?” It is available for $2.99. 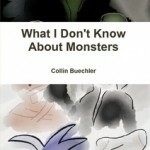 What I Don’t Know About Monsters is a picture book about monsters, 24 different monsters to be precise. These monsters range from well known beasties like Vampires and Were-wolves to lesser known creatures such as Sock Gnomes and Leaflings. The Intended age group is 5-8, and is available for $3.99. As is normal for iBooks they are slightly behind the game and there is some syncing that we anticipate will occur over the next week or so. As such the cover for Harbinger is not correct (But that won’t change your enjoyment) and What I Don’t Know About Monsters is still pending. Additionally the author name change has not been processed at Apple yet, but is in place at B&N, Amazon and Kobo. Please help support the site, support me and get some darn fine literature in the process.